Enjoy this project in the kitchen of our previous home. We’re currently remodeling a new-to-us home. Click HERE to see how I’m totally changing my decorating style! When I started adding farmhouse style to my kitchen, I knew that one of the first items that had to be checked off of the list was to replace my glass top table. 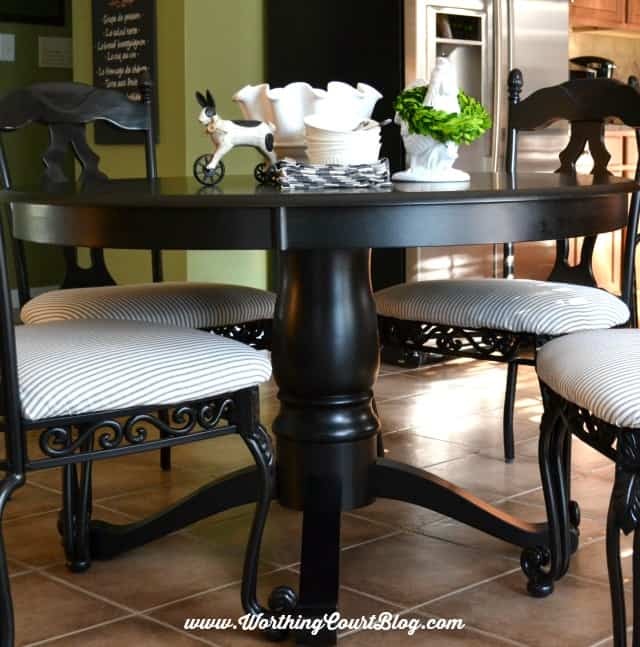 I opted for a 48″ round black pedestal table from Walmart. My kitchen already has several black touches, so this table fits right in. I just love the chunkiness of the pedestal. Plus I was able to purchase this for under $200. I’ll admit that I was a bit nervous about ordering it online though. For such a low price I was concerned about whether or not the finish would be good and if it would be durable. I’m happy to report that there was no need for concern. The finish is perfect and has stood up to any abuse that we’ve thrown at it, so far. 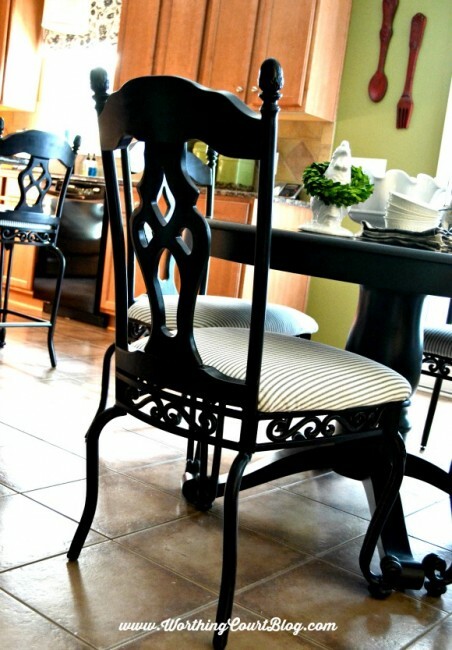 Well…just like buying a new pair of shoes requires a new dress…buying a new kitchen table requires new chairs. Right? Not. I searched high and low for some budget friendly chairs that I thought would be sturdy enough, but just wasn’t able to find any. 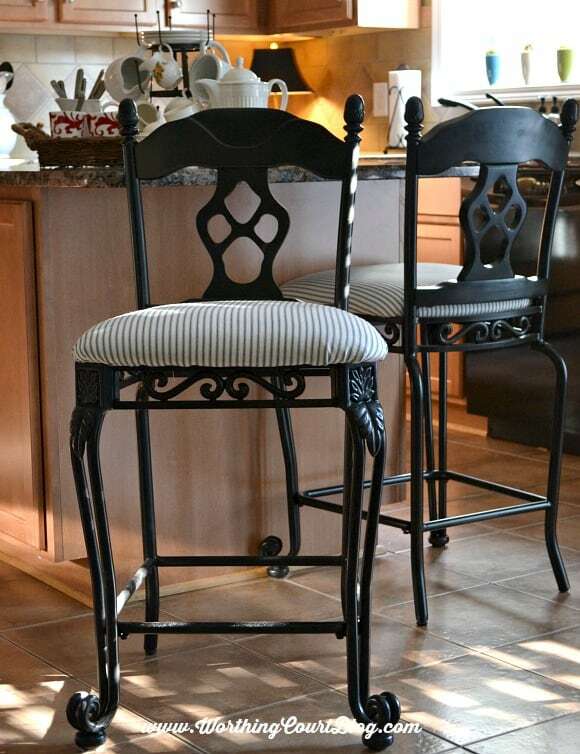 Several cans of black spray paint and 1 1/2 yards of black and white ticking later and my original kitchen chairs and barstools have an entirely new look! Before, the chairs were a mix of tan’ish metal and brown wood with red, green and gold fabric covering the cushions. 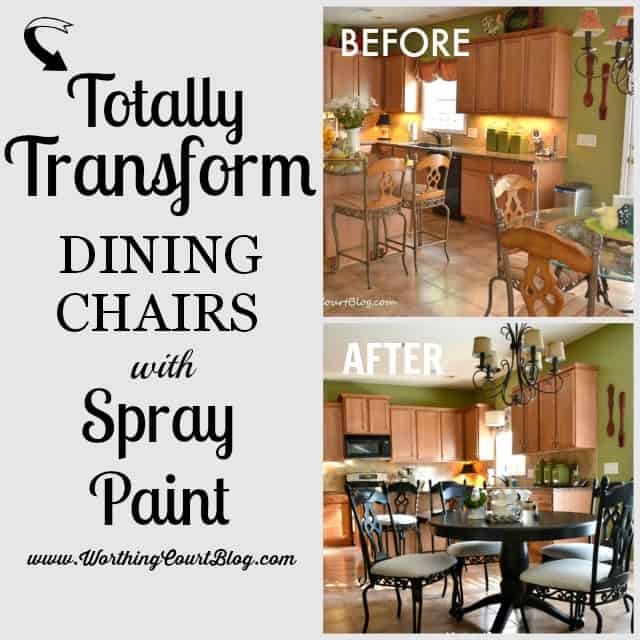 I’m amazed at how spray painting the chairs totally transformed the look of them. The barstools received the same treatment. The only difference is that I spray painted a clear sealer to help prevent scuffs from shoes where you rest your feet when sitting there. So far, so good. 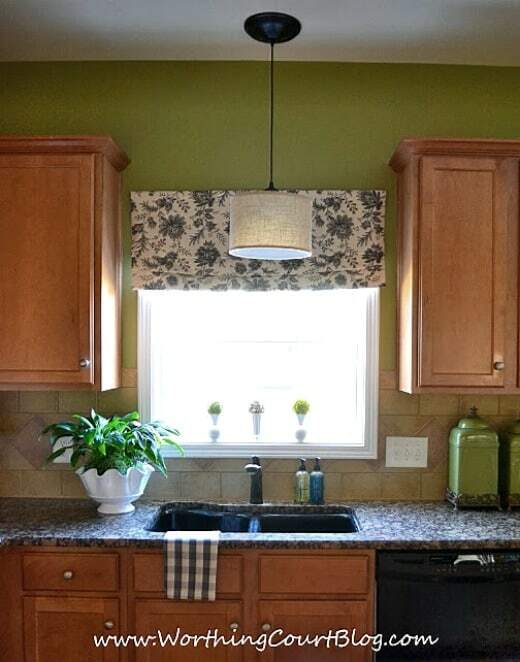 The other change that I made to this area of the kitchen was to add burlap shades to the chandelier above the table. You know burlap chandelier shades can be pricey if you’ve looked in any catalogs, but I found these at Garden Ridge for $5 each. Take a look at how far this space has come. 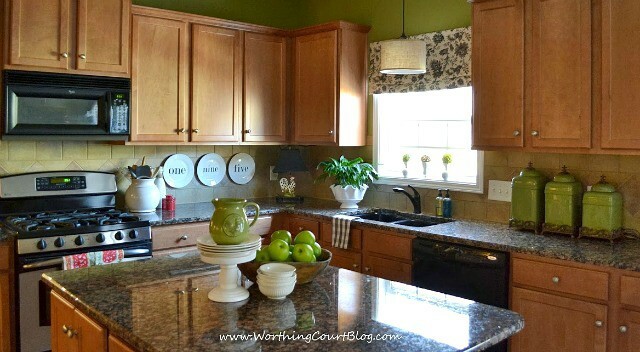 You might not think it’s possible to change the look and feel of a kitchen without painting cabinets, painting walls, replacing counters and other costly changes, but I would have to disagree. 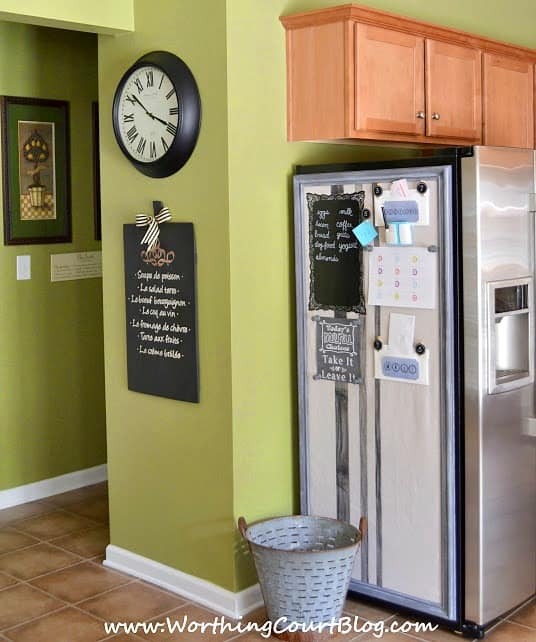 I think that by making a few inexpensive changes, my kitchen looks totally different than it used to. So tell me – have you ever tried to change the look and feel of a room without making major changes? What did you do? This turned out Gorgeous!! You did an awesome job! Thank you so much, Kelly! Hope you have a great week. OMG, these look so much better painted black! 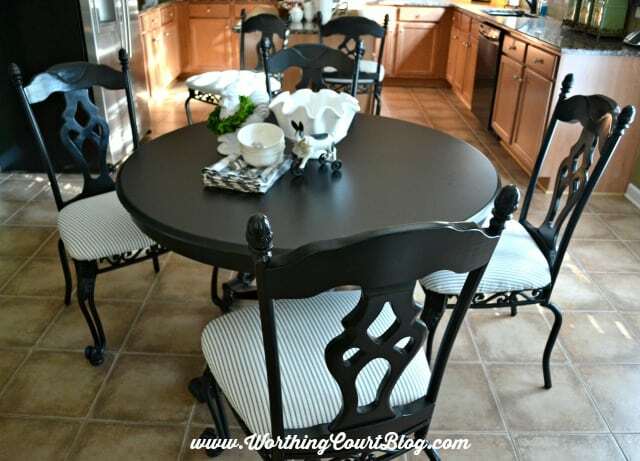 If you think the table is too small for your new breakfast area, you might think about putting this set on your covered porch with colorful fabric seats….although the black might get a little dusty out there…just a thought. The transformation is amazing, isn’t it? Good idea to use the table on the screen porch! Thank you, Shirley. I couldn’t believe how different they look! Looks great Suzy! I’ve always loved your kitchen. Thank you so much, Stacey! Have a great day. The new spray paint products are AWESOME, plus they adhere to surfaces flawlessly (as long as you follow the directions). Lovely update. BTW, a couple of years ago I ordered an outdoor acacia table & four armchairs from wallmart.com for @$200 as I needed for a family gathering. I was pleasantly surprised by the great quality AND those same pieces are still on my patio! Hi Jeanne. I’ve been pleasantly surprised by furniture pieces that I’ve purchased from Walmart. I have an outdoor “wicker” table and chairs that I purchased from them around 2003 and it is still in excellent condition. Wow, amazing transformation ! Paint can work wonders! 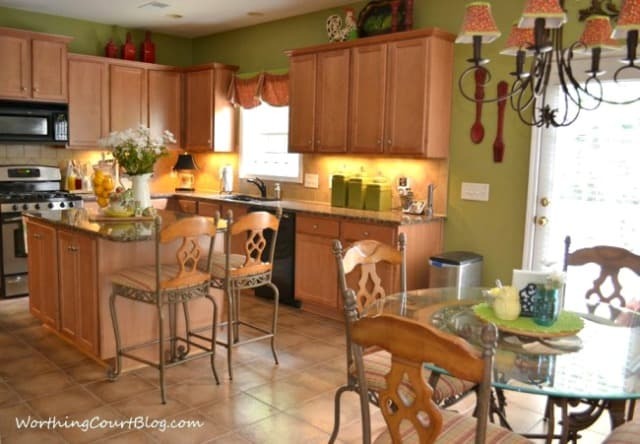 You did a wonderful job and the kitchen looks beautiful!! 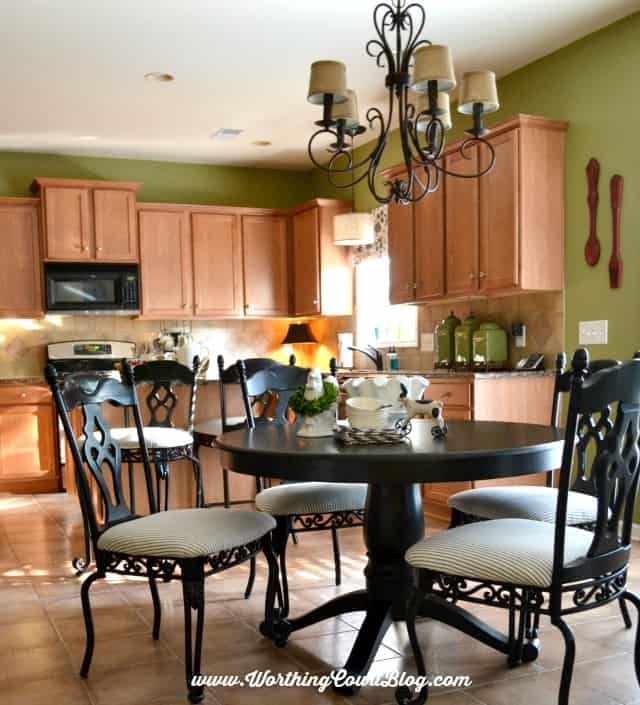 If you don’t mind my asking, what is the paint color in the kitchen? We are looking to paint a DR and 2 small kitchen walls, a shade of green. Yours is lovely! Hi Jaybird. So glad you like the kitchen! The wall color is Koi Pond from Sherwin Williams. Blessings to you as well!